There are lots of day hike options around Schlegeisspeicher and it’s also on the way of several long hikes, such as the Berlin High Trail. 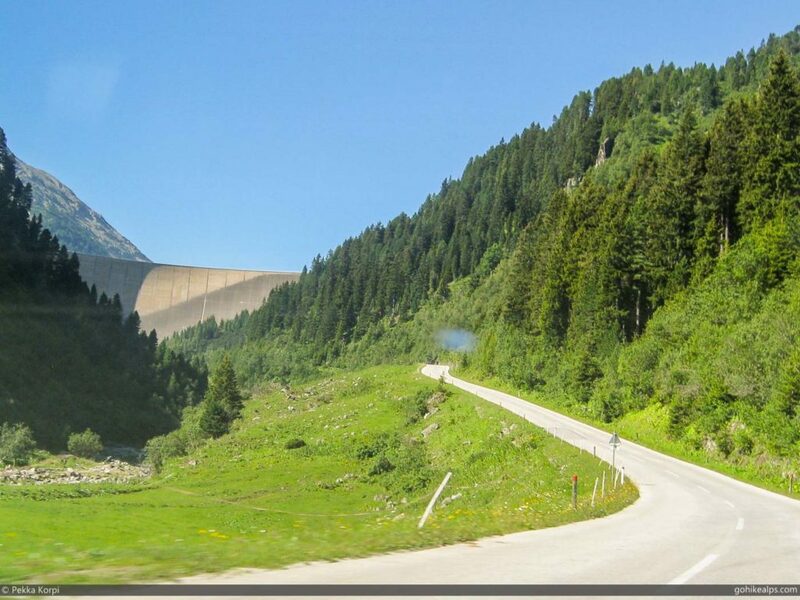 It’s a man-made reservoir, providing water to a hydropower plant from which water then flows to Speicher Stillup near Mayrhofen, after electricity has been produced. 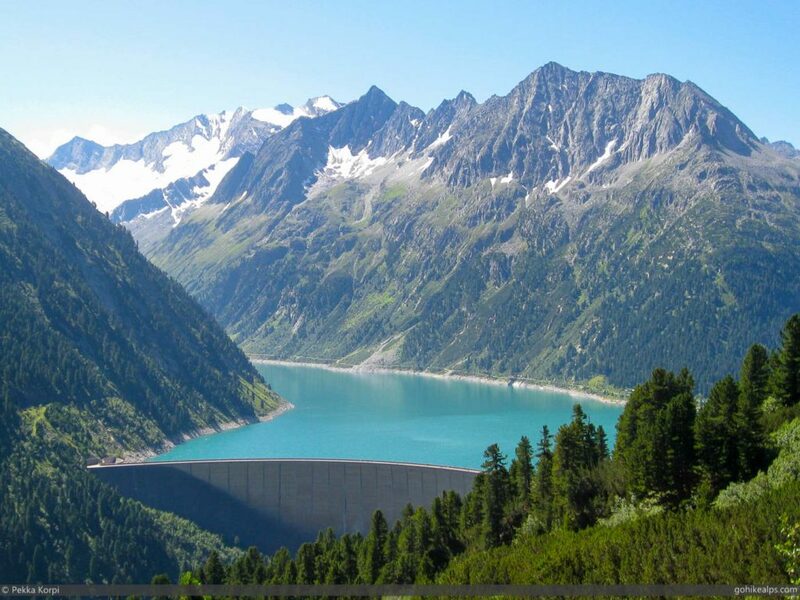 There’s a total of five artificial lakes near Mayrhofen all providing water for hydropower plants in the area. Check this story for a hike at Speicher Zillergrundl, another one of these beautiful reservoirs. The hydropower system in this area is pretty impressive in itself if you’re into that kind of thing, and the lakes are absolutely beautiful, even if they are man-made. Schlegeisspeicher is easy to reach from Mayrhofen. If you have a car, you can easily drive there on the Schlegeis High Alpine Road. Parking is available and at least for us, fairly early in the morning it was easy to find space but I imagine this could be a problem later in the day. The road is about 15km and do note that there is a road toll, I think 12€. Taking a bus is also a possible and in some ways better option. Taking a bus opens up more hiking possibilities for day hikes and longer treks. For example, you could walk over to Hintertux and get a bus back to Mayrhofen from there. 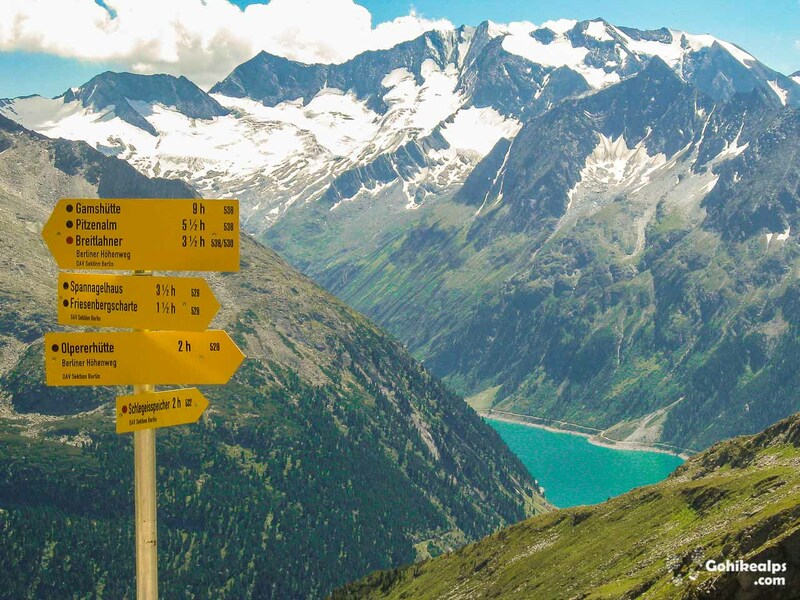 Or, if you have several days to spend, you could start the Berlin High Trail mid-way and hike back to Mayrhofen. The road is only open in the summer, from June to October and as far as I know, the opening and closing of all the huts and restaurants in the area are tied to that season, too. We had planned a round day hike from Schlegeisspeicher (at 1782m / ~5850 ft) up to Friesenberghaus (at 2477m / ~8125 ft) and then looping back to the Olpererhütte (at 2388m / ~7850 ft) on the high trail. From there it would only be a roughly 1 hour descent back to our car at Schlegeisspeicher. We didn’t expect this to be a strenuous trip at all and it wasn’t. It was very pleasant and we were blessed with absolutely wonderful weather! The path to Friesenberghaus (http://www.friesenberghaus.at/) starts at the northern end of the reservoir, just across the road from the end of the dam. The number of the trail is 532 and you can’t miss it. 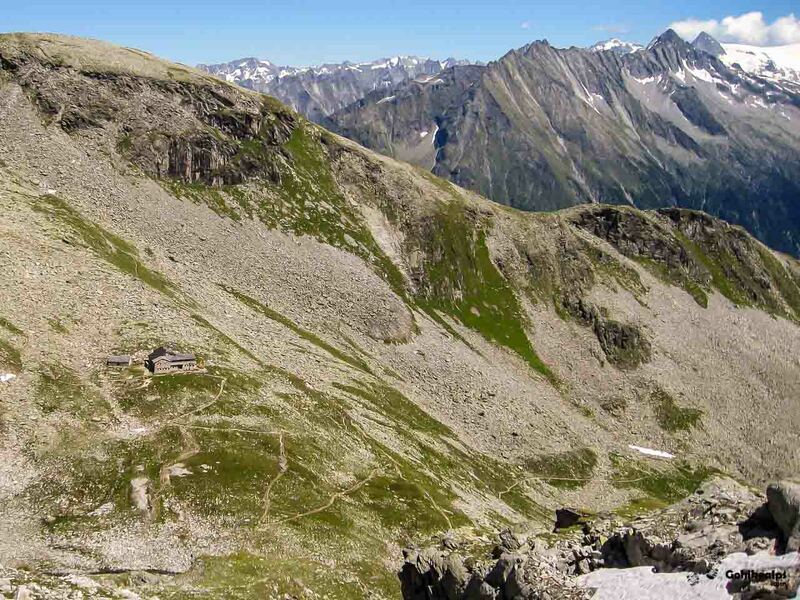 If you need fortification before you go, Dominikushütte (http://www.dominikushuette.at/Welcome.htm) is right there to provide food, drinks and shelter. The trail starts in a pine forest and almost immediately crosses a stream. Then it eventually starts winding up towards the pastures above. The further along you go, the more impressive the view gets on Schlegeisspeicher which is now behind you. 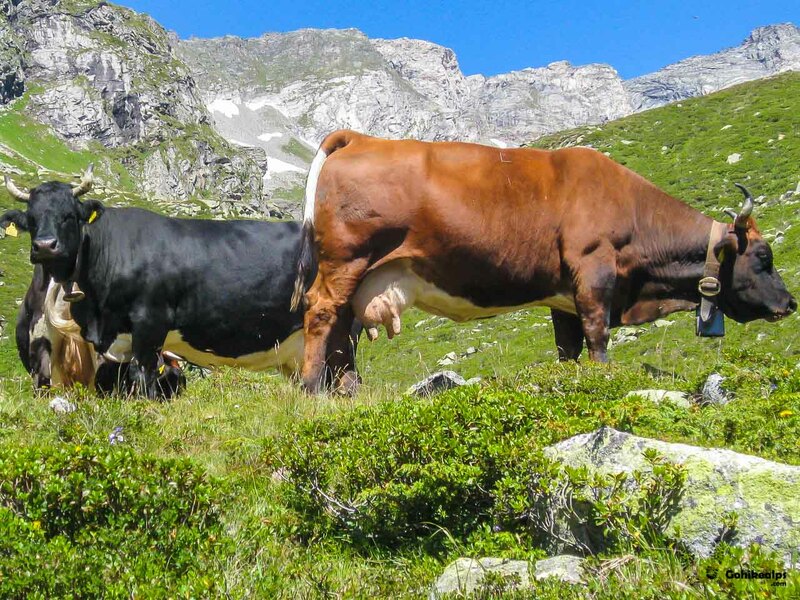 Cows, probably the most typical Alpine animal. On the way up to Friesenberghaus. You will start to see glimpses of Friesenberghaus and at some point lose visibility to Schlegeisspeicher. As you ascend, you will see the top station of the Hintertux ski area on the left (West). There’s a panorama viewing platform on top of it and it is open for summer glacier skiing. The trail up to Friesenberghaus takes about 2-2½ hours and is easy. They offer food and rooms. We stayed for coffee and some drinks and continued on to the Tiroler Höhenweg and Olperer Hütte. From Friesenberghaus you first go down to a small lake and keep on the left side of it, on trail number 526. From the lake you then go on a rather steep climb to reach the main trail (continues as 526, it just makes a small detour to Friesenberghaus) and take a left (South) towards Olperer Hütte. 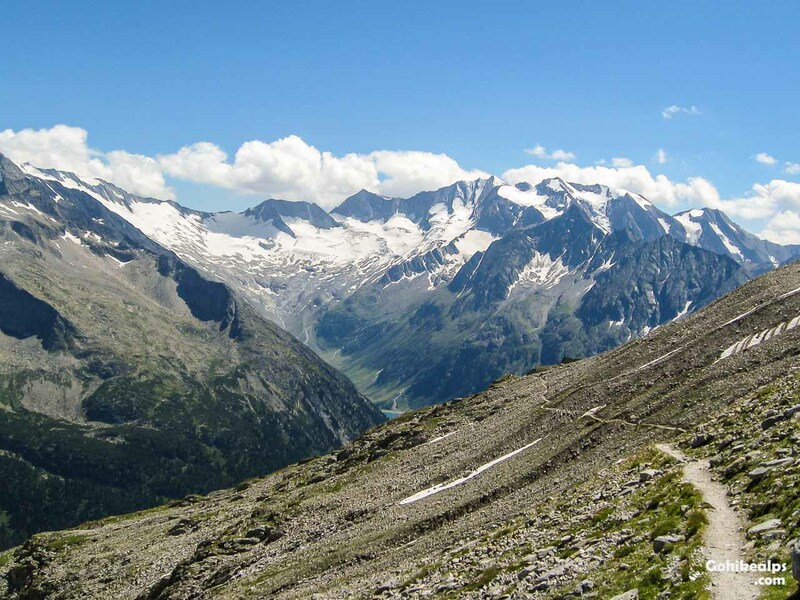 This section is a part of many long distance multi-day hikes: The Berlin High Trail, Tiroler Höhenweg as well as the Peter Habeler-Runde. Maybe some others, too, but these were the ones mentioned on our map. Options near Friesenberghaus with Schlegeisspeicher far below. The hike from here to Olperer Hütte is not demanding at all since there is not much altitude difference and the little there is, is mostly downhill. However, the views here are spectacular. You get to see Schlegeisspeicher in all its majesty and all the way to the end of the Schlegeissgrund valley, and the glacier at the end where the Italian border is. Absolutely beautiful. The walk from Freisenberghaus to Olperer Hütte is about 2 hours but in good weather I would build in some time for photos and just taking a break or two along the way. The Olperer Hütte is beautifully situated above Schlegeisspeicher. Established in 1881 it is one of the oldest mountain huts in the eastern Alps and provides food, drink and shelter. We opted for food and drink but thought that this would be a nice place to stay the night in case of a longer hike in the area. From here we only faced a simple descent back to Schlegeisspeicher which I think took us a little more than an hour. Our car was waiting and we drove back to Mayrhofen for dinner and sleep. All in all, a beautiful day and an easy day hike easy to recommend! This hike takes a total of about 4½ hours of walking but on I nice day I recommend not to rush it. The views are worth staying up there for a while. As far a mountain hikes go, I consider this an easy one but there is 700 or so meters of vertical to ascend, so it will inevitably take it’s tall. However, if you do this as a day hike, you don’t need much gear. I recommend Mayrhofen as a base camp. Click here for accommodation options at booking.com. Make sure you have the necessary gear for a day hike. 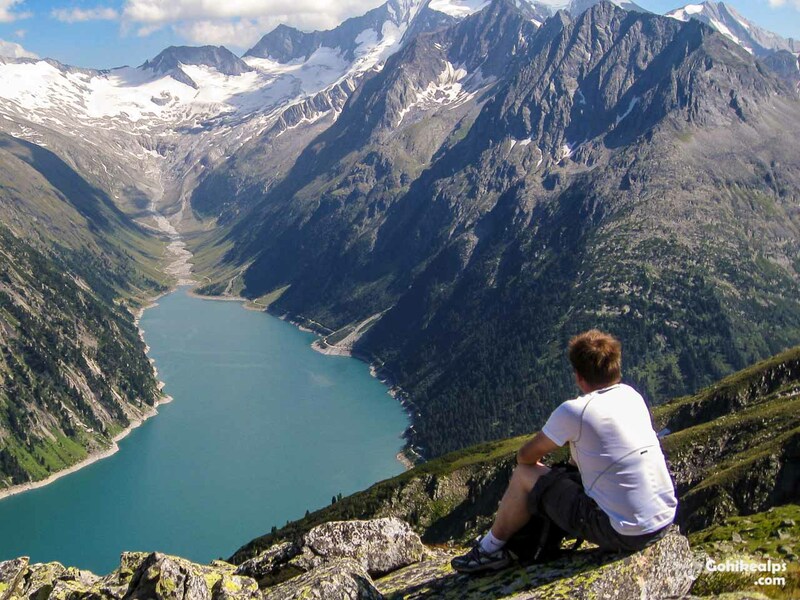 Click here for the Ultimate Packing Guide for the Alps!